The Kingdom Hearts Final Mix - Additional Tracks album cover. Kingdom Hearts Final Mix - Additional Tracks is a CD of additional tracks from Kingdom Hearts and Kingdom Hearts Final Mix. It was released on December 26, 2002 and was published by Walt Disney Records. The songs were composed by Yoko Shimomura, Nobuo Uematsu, and Modest Moussorgski and was arranged by Yoko Shimomura. 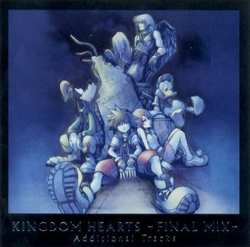 The tracks were later included in Kingdom Hearts Original Soundtrack Complete.